Dr BJ Field (Osteopath), founding Director, Canberra City Osteopathy, launching the new business space in London Circuit, 2008. The Canberra City Osteopathy team, University Avenue clinic, 2007. 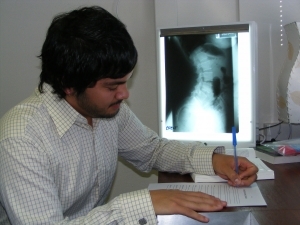 Dr Noel Cauchi (Osteopath) approx 2008. Shauna Riley, Physiotherapist and Massage Therapist, approx 2008. 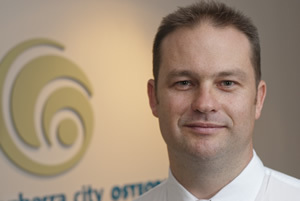 Dr BJ Field (Osteopath), founding Director of Canberra City Osteopathy, approx 2008. Canberra City Osteopathy was established in 2004 after I had performed locum work for some years here, and abroad. The clinic from its very conception has been about an excellent service from the first point of contact to the ongoing care of the patient from the team approach. The ethos of the clinic is to provide patients with appointments at their nearest convenience. My background as the National President of Osteopathy Australia gave me a privileged insight to the health terrain. During my career I have served on regulatory boards for the ACT and also Australia. Since 2001, I have worked both on and in Osteopathy and massage education which has given the clinic a greater observation into our graduates and how to deliver best practise to the patient. From these experiences we have grown processes and procedures and mentored our staff to be capable and reflective professionals. We have tutorials and ongoing continual professional development like no other, assuring the outcomes for the clinics patients are of the highest calibre. The rate of growth of our clinic demanded that we deliver diverse expertise with a team approach and we morphed into Canberra City Health Network in 2016 offering Exercise Physiology, Hydrotherapy, Massage Therapy, Osteopathy, Pilates, Physiotherapy, Psychology and Nutrition. Dr Evan Lallemand (osteopath) worked in our clinic from 2005 to 2007 bringing a lifetime of experience. Evan had been the Principal of the International College of Osteopathy. Evan had decades of service in state regulation and education. Dr Evan Lallemand left his experience and clinic with us at Canberra City Osteopathy. Dr Belinda Libbis (osteopath) from Inner North Osteopathy on Lonsdale St Braddon joined the team in 2011. Belinda works monthly at CCHN treating her long standing patients and is a member at our CCHN clinical faculty team. Dr Melissa Wisbey (osteopath) from “Balancing Life Osteopathy” based in Hawker. We have assisted those patients since 2015. Melissa has since moved to Victoria. Dr Stephen Webb (osteopath) from North Lyneham has joined the CCHN team in 2017. Stephen brings a long career in Osteopathy and is in our Casey clinic weekly. Canberra City Health Network has two partners in Shauna Riley, Massage Therapist and Physiotherapist, and Dr Noel Cauchi (Osteopath). These senior clinicians head up their relevant sections and work intimately with their teams to deliver great outcomes for patients with our patient-centred team delivery. Shauna brings a wealth of experience with a special interest in sports injuries after ongoing experience with local sporting teams such as the Canberra Raiders, ACT Brumbies and the ACT Academy of Sports women’s football. Shauna is a member of the Australian Physiotherapy Association and a board member of the ACT Sports Physiotherapy Association. Dr Noel Cauchi (Osteopath) has been a board member of Osteopathy Australia from 2009 to 2012 and heads up the Casey clinic. The clinics are at Level 1, 71 to 73 London Circuit Civic and 15 Kingsland Parade, Casey. The hours of operation are 7am to 7pm Monday to Friday, and 8am to 3pm on Saturday (closed on ACT public holidays). The rate of growth of our clinic demanded that we deliver diverse expertise with a team approach and we morphed into Canberra City Health Network in 2016 offering Exercise Physiology, Hydrotherapy, MassageTherapy, Osteopathy, Pilates, Physiotherapy and Nutrition.